Join us for another episode of ‘Afrobeat Karaoke’ on 27th of April 2017. It’s already shaping up to be another sold out edition of Afrobeat Karaoke! 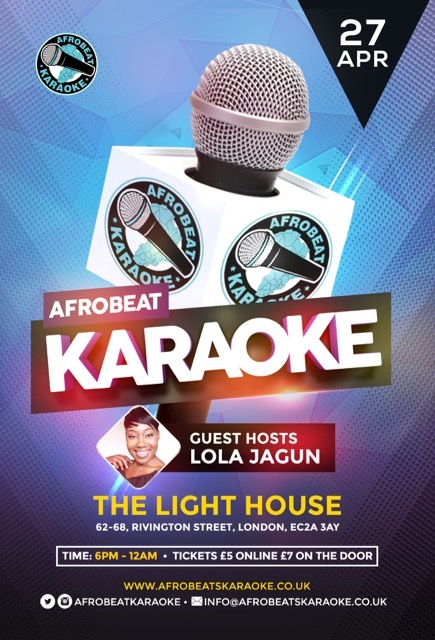 Trust us when we say #AfrobeatKaraoke is heaps of fun, if you are lucky enough to know someone who attended the previous nights do ask them 🙂 Or check our Instagram page for videos. Limited early bird £5 are sold out. You can still pay at the door!! If the music and atmosphere of the ‘End of Year’ party is anything to go by then this will be a fantastic night!